Cryptosporidium refers to a group of microorganisms of a variety of species which can cause a human disease called cryptosporidiosis. It's found world-wide in soil, food, and water. 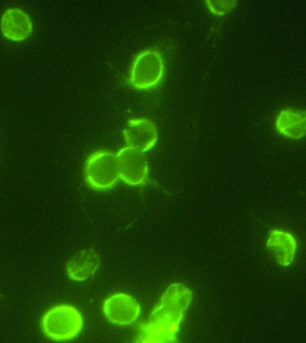 Cryptosporidium parvum, often called “Crypto,” is the most common. Cryptosporidium is a single-celled protozoan and parasite that lives in human or animal intestines. It is excreted in feces in the form of a dormant but hardy, thick-walled oocyst (“O-o-sist”), or fertilized egg, 3 to 5 microns in diameter. When ingested, it emerges from the oocyst and infects the intestine. Cryptosporidium can cause diarrhea, abdominal distension, nausea, fever, dehydration and weight loss. For those with healthy immune systems, these symptoms usually clear within a couple of weeks. For those with compromised immune systems, cryptosporidiosis can be a life threatening illness. Crypto can be reduced or removed from water by carbon adsorption, reverse osmosis, nanofiltration, ultrafiltration—by any filtration of absolute 1 micron rating. It is also controlled by ozonation and distillation. Chlorination is not a recommended treatment. NSF/ANSI has treatment standards under Standards 53 (Drinking Water Treatment Units), 55 (Ultraviolet), and 58 (Reverse Osmosis). In many situations, ultraviolet has become the preferred treatment.